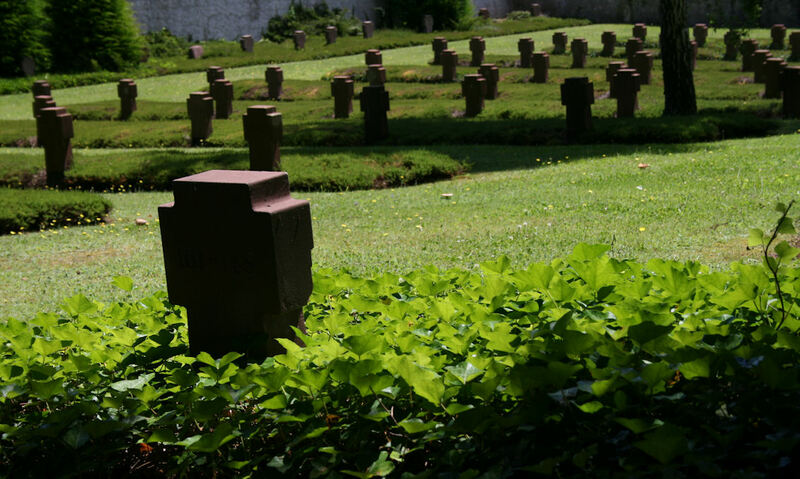 Munster Cemetery in Alsace is a place of stories. It tells of the worldness of war. From here I can see the graves of men who were French, German, British, Chinese, Jewish, Canadian and Muslim. Cimetière militaire Munster is at the back of the civic cemetery. It has a quiet, spacious dignity and though it flies a French flag, the graves of all are immaculate. 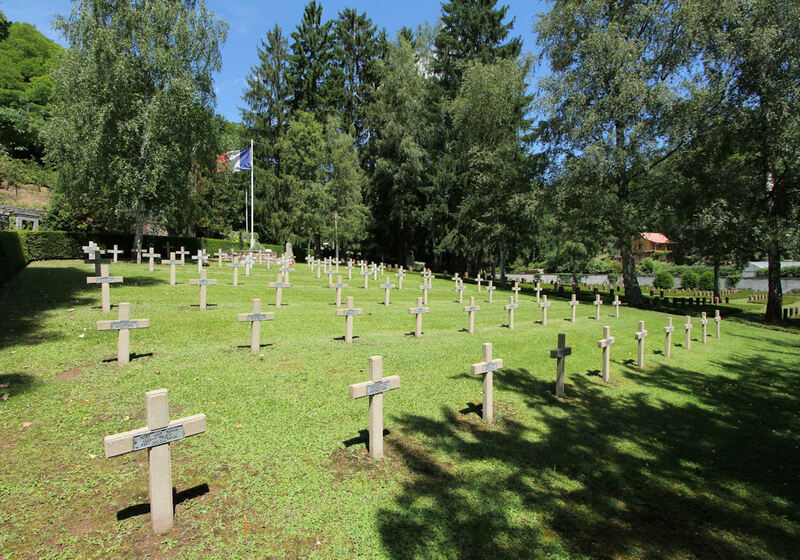 Just looking at one small row of ten French graves tells the story of the war-stripped mountains and wrecked valley-bed villages so bitterly fought for, so close by: ten men killed at Stosswihr, at Sattel, at Soultzbach; ten men brought from cemeteries at Ampfersbach, Stosswihr, Wihr-au-Val, Breitenbach, Metzeral in the early 1920s and reinterred. Paul from the Loire was 21, Gilbert from Allier was 41. Three of the ten are from Gérardmer, killed 30 kilometres from their loved ones at home. When these ten died, the war was less than a month old. So many stories. The Chinese man, Wang Bing, was part of a team employed to clear bodies from the mountain battlefields. He was killed in 1920 by a shell which exploded. 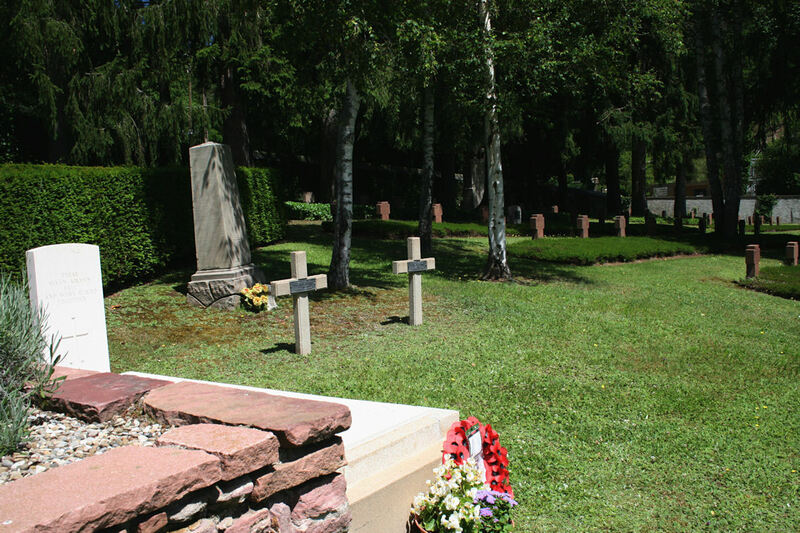 The six Canadians and one British airmen were the crew of Lancaster NN766 from Elsham Wolds which crashed on the mountainside at Hohrodberg on January 7th, 1945, on a mission to Munich. There is a warship officer who died in Benin in 1943. There are young Resistance fighters killed by mines or by the enemy. Not at Munster but at Sondernach, just down the valley, is young Resistance fighter Henri Stuckert, who hid in a First World War bunker on the Petit Ballon and was betrayed by a French policeman who had infiltrated the group. He was shot by the SS. 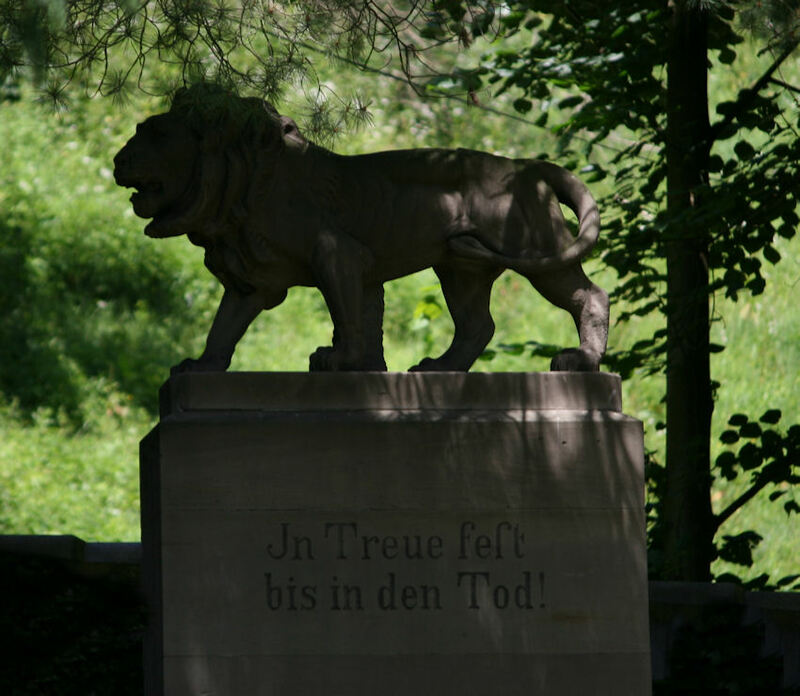 By the far wall of the cemetery is a large stone lion, which was erected in May 1916 by 23rd Royal Bavarian Infantry Regiment for their fallen comrades. 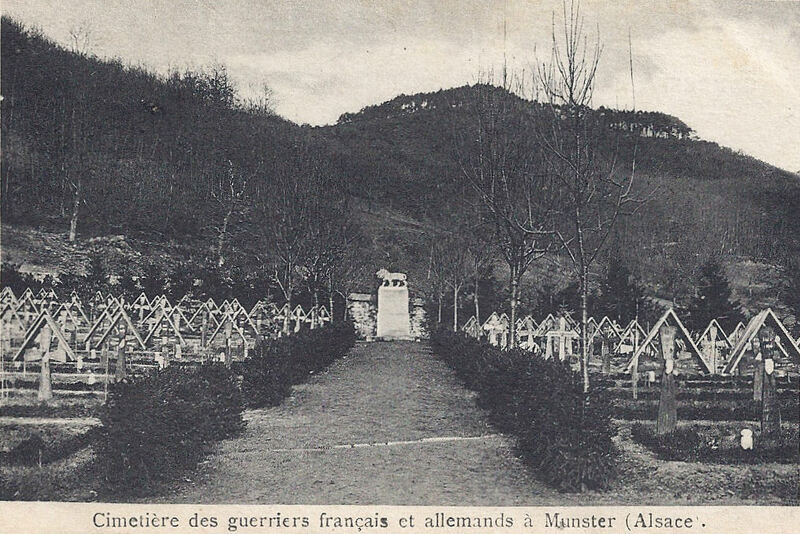 This postcard, written in 1923, shows that the hillside behind Munster is recovering from the vicious impact of war. June, 2012: The graves, then raw, are now peaceful. Nature is gently embracing them. Back to the Lion. There’s something curious about it. Look closely. 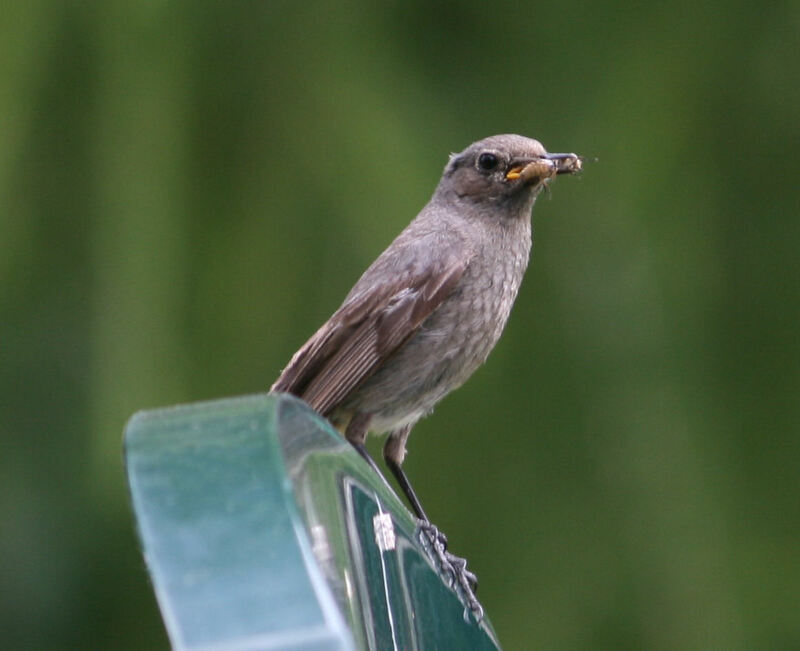 On one side face only there are numerous round holes – none on any other side. And on the front face only there are scored lines. It looks exactly as if someone was firing at someone else who was hiding behind the lion: as if some of the bullets hit the side of the plinth and some sheered off the front of the plinth. In my imagination I see this dating from wartime, someone escaping from an enemy and being cornered behind the lion. I don’t know. But there are too many marks and they are too specific to be just weathering. Taking a line from the shot marks, it’s easy to see where the gunman may have been standing. Edit. They are indeed bullet holes, which occurred on February 6th/7th 1945 during a shoot-out between units of the defending (and withdrawing) German 16th Infantry Division (named 16. Volksgrenadier-Division from October 1944) and the French 10th Division as part of Operation Cheerful. 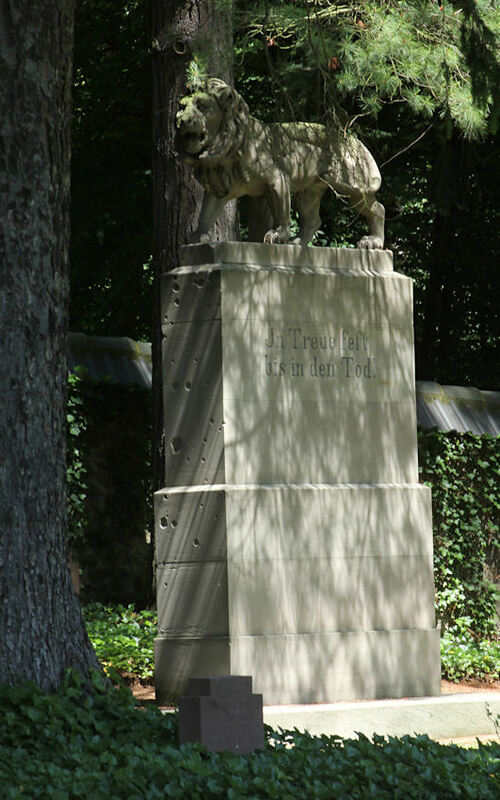 (I am grateful to David O’Mara for the explanation, and to Rob Schäfer for the revised name of the German unit and the date of the monument.) The evidence of conflict creates a chilling feeling, though it’s hot and still here. Time to leave the cemetery to its most regular visitor.